But as Donald Trump could have warned them, you let one of them in….Yes, Roderigo had a big family; and with six children, a Pope can’t get by just from skimming the profits of bingo nights. His daughter Lucretia was attractive, so he had no trouble arranging three lucrative marriages for her–and he oversaw her becoming a widow in time for the next marriage. (Annulments took too long, even for a Pope’s daughter.) Then, there was the irrepressible Cesare. Dad made him a cardinal when Cesare was 17, but the boy showed secular interests: murder, pillage and conquering all of Italy. Well, Roderigo could hardly refuse his son (especially if the son might kill him), and the Pope actually liked the idea of Italy as a family heirloom. Such a conquest was, however, a rather daunting goal. The Italian city states were always at war, but the wars barely amounted to misdemeanors. Ferrara would seize an acre from Rimini, and Rimini might retaliate by defacing a fresco. And the Papal States definitely were not supposed to attack anyone. But Roderigo was not much for etiquette. (For instance, he referred to his children as his children; every other pope pretended that his spawn were only nephews and nieces.) He invested Cesare with the full military resources of the Papal States (Stop laughing; you could buy a lot of mercenaries with purloined Church funds.) But, yes, that would not be enough to quickly conquer the peninsula. 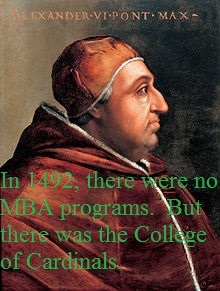 Fortunately, the Pope was a man of faith: he fervently believed in his own craftiness and everyone else’s gullibility. So, Roderigo encouraged the King of France to invade Italy. Once the French invaded in 1494, the Pope then began encouraging Spain to defend its possessions in Southern Italy. Roderigo was even negotiating with the Ottoman Empire. Somehow, he expected to play everyone off against each other and end up with all of Italy. He might have even succeeded but for one miscalculation. Seventy-year-old men have a tendency to die, and in 1503 men usually died at 45. Roderigo had beaten the actuarial table but he couldn’t do it indefinitely. Without Dad, Cesare was without an empire and Lucretia was stuck in her third marriage. Nonetheless, Roderigo definitely left an legacy. The name Borgia is still remembered. And Spain, allied with the Holy Roman Empire, would be fighting France over the control of Italy for another 30 years. In fact, the Papacy and the Holy Roman Empire were so preoccupied with Italian politics that when a German theology professor complained about the Church’s corruption, no one paid any attention to Martin Luther (except the population of Northern Europe). 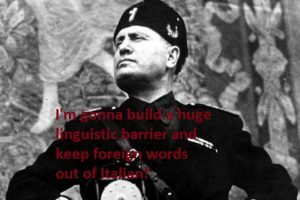 On this day in 1929, Fascist Italy made a stand for linguistic purity and banned the use of foreign words. However, if Il Duce wanted to be consistent he would have had to change his name to Guido Mussolini. Benito is embarrassingly Spanish. Worse, he could not have his rebaptism at St. Peter’s Church–at least until the Church changed its name. Peter is a Greek word, you know. In fact, so are Catholic, Jesus and Christ. (Fortunately, the word Pope would be acceptably kosher in Italian.) The Church might have agreed to being Mondo instead of Cattolico, but it likely would have objected to renaming the focus of its worship. Divo Carpentiere? There also would need be new nomenclature throughout Italy. Sicily and Naples are Greek names. Tuscany is Etruscan. Lombardy is named for the long beards on the German barbarians who seized the region. In fact, even the name Italia might not have passed the purity test. Those big mouth Greeks were the first to use that term, applying it to the southern part of the peninsula which they colonized. If Italy were named after the legendary Sicilian ruler Italos, then the derivation would have been unpatriotically Greek. However, some etymologists believe that the Greeks took (and mispronounced) the indigenous people’s word for their major occupation–raising cattle. 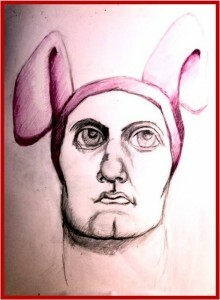 So, going back to the word’s pure roots, Mussolini should have changed the country’s name to Vitalia–land of veal. Henry IV was very disappointed in the Percy clan. It was a powerful family in Northern England and very useful to a conniving usurper. After helping him seize the English throne and kill the rightful (if preposterously incompetent) King Richard II in 1399, however, it turned out that the Percys could not be trusted. The rapacious family actually expected every title and estate that Henry had promised them. Didn’t they understand politics? Apparently not. The Percys rose in rebellion, having suddenly realized that Henry was an usurper. The now legitimist nobles were supporting the royal claims of the Earl of March–who happened to be related to the Percys by marriage. Of course, Shakespeare covered this topic–in iambic pentameter–in Henry IV, part I. So you know that the rebels were led by the dashing teenage jock, “Hotspur” Percy but he was killed at the battle of Shrewsbury in a climactic duel with that reprobate teenager Prince Hal. Well, not quite…. Hotspur once had been a teenager; it is a prerequisite when you are 38 years old. That was his age at the battle of Shrewsbury. In fact, he was two years older than Henry IV. Prince Hal actually was a teenager–16–but he did not kill Hotspur. That deed was accomplished by an anonymous archer whose arrow determined the outcome of the battle. Up to Hotspur’s unlucky catch, his forces seemed to be winning; not a knockout decision but ahead on corpse totals. However with the death of their leader, the rebels abandoned the field and Henry IV retained the throne. A year or so ago, the New York Times had an article on the Duchess of Northumberland. Being egaliterian/vulgar Americans, we would call her Mrs. Percy. After six hundred years, that is definitely job security. In 325, under the protection of the Emperor Constantine, Christians had emerged from the catacombs and now were at each others’ throats. As emperor and referee, Constantine summoned a Church Council to his palace in Nicaea, trying to get the various factions to concur on anything. Yes, the Council agreed that there was a Trinity. No, the clergy did not have to be celibate. (That question would be raised again.) And there was the matter of scheduling Easter. Traditionally, Easter was based on the Jewish Passover. It was Gospel, literally. But there were those distrusted a reliance on the Jewish calendar. What if the Jews deliberately sabotaged the timing of Passover to embarrass the Christians? How old is Pat Robertson? But Constantine agreed; his Church should be self-reliable. If Jews could figure out those lunar convolutions for Passover, certainly the Christians could do the same for Easter. The Emperor ordered that Easter would be celebrated after the first full moon following the Spring Equinox. If you have noticed the schedule on Turner Classic Movies, this is the birthday of John Garfield. Although Garfield is now barely remembered, he was the first of the tough, chip-on-the-shoulder, punk leading men. He was the brooding young rebel when James Dean was only alienated from his kindergarten. Furthermore, Garfield was conspicuously ethnic; his stage name may have seemed homogenized but he still obviously was Jules Garfinkel of the Lower East Side. He appeared at a time when the Hollywood barrier for acceptable ethnicity was James Cagney’s engaging if feisty Irishman. But Garfield’s English was very first-generation and, by the standards of the times, far more New York than American. His compelling presence breached that barrier as well, creating the way for Dustin Hoffman, Robert DeNiro and Al Pacino. Garfield was never a star of the first magnitude: no Gable, Flynn or Cooper. He certainly would have been out of place in most costume epics. Cecil B. DeMille would never have known what to do with him. Yet, if Garfield was not the essence of Hollywood glamour, he was the world-weary everyman whose bitter wisdom and bad luck resonated with an audience that knew the deprivations and losses of the real world. Since he did not fit the Hollywood mold, the studios made films to fit him. “Humoresque”, “The Postman Always Rings Twice”, “Body and Soul” and “Force of Evil” are his best films. You might also be interested in his first film, “Four Daughters.” By today’s standards, the movie is hokey. We would dismiss it as a “B” feature; but it wasn’t. In fact, the film was considered sensational, “The Last Tango in Paris” by the standards of 1938. John Garfield’s alienated, nihilistic, self-destructive character was unprecedented in Hollywood films. Such a character could be a gangster but NOT the romantic lead. 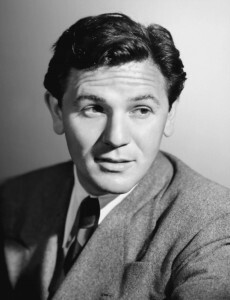 Unfortunately, John Garfield didn’t live to become an older actor. The pressure of the Hollywood Blacklist and the effects of his childhood’s rheumatic fever led to his early death. “Force of Evil” might describe his encounter with the House Committee on Un-American Activities. Jules Garfinkel of New York knew too many Leftists for his own–and America’s–good. Garfield admitted his support of the Spanish Republic and other liberal causes; if any of them had been Communist fronts, he was unaware of that. He apologized for his political naivete but he also refused to divulge the names of other people involved in these organizations. His characters never squealed, and neither did he. So John Garfield ended up being blacklisted by the studios. Once again, he was the kid from New York scrounging for work. His characters usually ran out of luck; so did he. He died at the age of 39, leaving behind a wife, two young children and the next generation of actors. 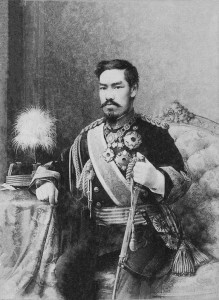 The war began with Japan’s surprise attack on the Russian naval base at Port Arthur. (Yes, the Japanese thought that the tactic would work a second time, too.) The Russians may have been surprised, but no one else was. In the preceding two months, American reporters were sent to Japan to cover the impending war. Apparently, no one in Russia read the Hearst newspapers, but when William Randolph demanded a war, the Mikado wouldn’t have dared refuse. However, the influx of American reporters caused a problem for the Japanese. A free press, even a pro-Japanese one, could report casualties and setbacks. So the Japanese attempted to confine the American journalists to hotel bars and press releases. (That tactic has also been repeated.) A few reporters managed to evade their handlers and get to the front. Of course, the Japanese army was unhappy with the uncontrolled press. No doubt a few officers were prepared to arrange accidents–but really–many American journalists would have had fatal shaving accidents with samurai swords? The Japanese thought of a more adroit way to suppress the coverage. Cameras would be arrested for criminal activity. Reporters could write unfettered reports, but there would be no photographs for evidence—other than what the Japanese approved. Russia’s humiliating defeat could be attributed to the imbecilic Tsar, his incompetent generals or his hapless admirals. But Russia’s official scapegoat was the Jews. This seems surprising since very few of the Japanese generals and admirals were Jewish. However, it could have been an honest mistake. Mikado does sound vaguely Hebrew, one could easily confuse Rashomon with Rosh ha Shonah, and weren’t the Japanese always talking about their Sam and Murray Code? We tend to think of Lenin as a misunderstood old dear, just a badly tailored Edmund Gwenn. Of course, that is only because we are comparing him to Stalin. In fact, Lenin wasn’t that old, a mere 47 at the time of the November Revolution. (Now, don’t you feel like an under-achiever.) Nor was he remotely lovable. Although he was not a Stalinoid monster, Lenin was a certifiable creep. He was an obsessed, remorseless tyrant who actually read calculus books for fun. Would you be any less dead if Lenin shot you for the sake of dialectic materialism than if Stalin shot you because it was his hobby? So, it was not surprising that Lenin would establish a secret police just six weeks after the November Revolution. (So much for the honeymoon.) The first head of the Cheka was Felix Dzerzhinsky who was unique among the Bolshevik aristocracy in that he really was an aristocrat. Anyone who slighted him at a soiree or beat him at tennis probably did not live to regret it. Dzerzhinsky may have betrayed his class but not his tastes. In the midst of revolution and civil war, Dzerzhinsky requisitioned a Rolls-Royce for his personal use. It should be noted that his timing was as impeccable as his style. He died of heart attack in 1926, and so avoided a less natural cause of death from Stalin. In organizing the Cheka, Lenin was just observiing a hallowed Russian tradition. Since Ivan the Terrible, the Tsars had relied on secret police as well. Indeed, Ivan set the standard. His death squads, the Oprichniki, had a very distinctive insignia: the severed head of a dog on their saddles. The dog’s head presumably would sniff out treason. Ivan distrusted his nobles, and the Oprichniki eliminated the causes of his anxiety. Of course, even the Oprichniki found that Ivan could be a little too whimsical. There is a story of a father-and-son team who had risen high in the Oprichniki hierarchy. While at a feast, Ivan thought of a test of loyalty for entertainment. The son was ordered to strangle the father. Before the guests, the son did as he was ordered. Then Ivan ordered the son to be executed; after all, how could Ivan trust anyone who would kill his father? At least, subsequent Tsars and their secret police refrained from decapitating dogs for decor. (However, Faberge could have made some wonderful facsimiles.) In the last decades of the Russian Empire, the secret police was known as the Okhrana. Their chief concern was suppressing the growing radical movement. They proved so successful at infiltrating revolutionaries groups that Okhrana agents actually were managing many of the revolutionary plots. In 1911, Okhrana oversaw the assassination of the Russian Prime Minister, Pyotr Stolypin. A political moderate, at least by Russian standards, Stolypin’s attempts at reforms outraged the conservatives. So, Okhrana manipulated a thoroughly infiltrated radical group to kill him. The actual assassin was a genuine revolutionary but his supervisor and his supervisor’s supervisor were all on the Okhrana payroll. It was a perfect Okhrana coup: the reactionaries kill the moderate and frame the radicals. Yes, the Okhrana even infiltrated the Bolsheviks. One of their double agents was a young Georgian who called himself Stalin. We can surmise that Stalin only gave up the names of the people he didn’t like. Of course, that could have been enough to crowd Siberia. Oprichniki, Okrana, Cheka, KGB…These are the happy memories that Vladimir Putin is enjoying today. And who says that you can’t bring back the good old days? Porfirio Diaz was the best President of Mexico that American business ever had. For just a reasonable–if continual–bribe, railroads, Standard Oil, and mining companies could exploit all that Mexico had to offer. Some of Diaz’s amassed fortune was trickling down to the populace, at least to his family, the crew of his yacht and the teenage girls who seemed to rejuvenate the elderly tyrant. However, that was not really a majority of Mexico’s population. Diaz had been a war hero against the French in the 1860s; but 34 years of corruption seemed a sufficient veteran’s benefit. By 1910, Mexico was ready to overthrow the outrageous rascal, and the hopes and the grievances of Mexico would center around a most incongruous figure. As a revolutionary, Francisco Madero was the soul of well-mannered moderation. As a leader, he was innocuous rather than charismatic. The hope of Mexico’s impoverished masses was a wealthy aristocrat who had been educated everywhere but Mexico. But this education abroad had made him an admirer of societies that were neither feudal relics or shameless kleptocracies. Even if he did look upon Mexico from an Ivory Tower, it was with genuine compassion. His liberal principles had earned him several bouts in a Mexican prison. However, having the advantage of being rich in the Diaz days, he could always bribe his escape. While in exile in Texas, Madero issued a call for the Mexican people to overthrow Diaz and reestablish democracy; it was on this day in 1910. Rebellions began throughout Mexico, and even the army seemed loathe to defend the Thief-in-Chief. Six months later, Porfirio Diaz was on his yacht, cruising to Europe with his usual contingent of teenage girls; he lived happily ever after. Francisco Madero was the new President. On his private estates, he had genuinely improved his workers’ standard of living; he imagined that he could do the same with all of Mexico. Unfortunately, Mexico proved a little more difficult. Moderation seemed to please no one. Revolutionaries wanted more drastic reforms than Madero was prepared to make. Conservatives wanted no reforms at all. Worse for Madero, his innocuous moderation terrified American corporate interests in Mexico. They evidently preferred paying bribes than taxes, and a scrupulous Mexican government might interfere with their business. 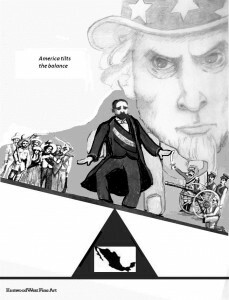 The American Ambassador Henry Wilson, representing those business interests, initiated his own foreign policy: a military coup to overthrow Madero. Assuming that everyone had his good intentions, Madero had not tried to purge the Mexican Army of Diaz’s cronies. Unfortunately, a number of generals proved quite nostalgic for the old kleptocracy and were eager to reestablish it. Ambassador Wilson had no trouble orchestrating the coup. Madero had entrusted his security to Gen. Victoriano Huerta. Huerta organized the firing squad. If you have seen “The Wild Bunch”, “One Hundred Rifles”, or “Viva Zapata” you know what happened next. It was a free-for-all civil war. Any general could claim to be the President, and anyone could claim to be a general. The Conservatives fought the Revolutionaries, and the Revolutionaries fought each other. In hindsight, this probably was not the best environment for American businesses; it was impossible to keep track of whom to bribe. By 1920, the civil wars had bled themselves dry, and Mexico had arrived at a political compromise that more or less has lasted to this day: a government of moderate thieves. Let’s solve a mystery. How can a club be both a social organization and a weapon? It actually is a case of mistaken identity that began in the Middle Ages. Old English and Old Norse are both Germanic languages. In addition to this lingual similarity, the Vikings could always make themselves understood. When a horde of warriors is sacking and slaughtering, you can usually interpret its mood and intent. One particular form of Viking expression was the “klubba”, a blunt, heavy weapon. When a Viking wielded his club, his British victims felt a clump. In Old English “clump” literally meant lump or mass, but the word had several uses. It could refer to an accumulation or cluster of objects; in that context, we still refer to “a clump of dirt” or “a clump of trees.” Unfortunately, a clump could also describe the mass of wood in the Viking arsenal, or the lumps it caused. Since club and clump had similar sounds and overlapping definitions, the words eventually became confused and interchangeable. Clump acquired a heavy, creepy context, while a club could be an innocuous collection. England in the late 17th century was a wonderful time for debauchery, and the diction was as lax as the morals. When people, bound by a common interest or vice, gathered together these associations now were called clubs. Three centuries later we’re stuck with that mistake. If there had only more regard for proper English, your insurance agent would be a member of the Rotary Clump. But how did vindauga become our prevalent word for a scenic hole in a wall? Of course, modern Scandinavians are renowned for furniture, but their Viking ancestors never showed any flair for interior design. 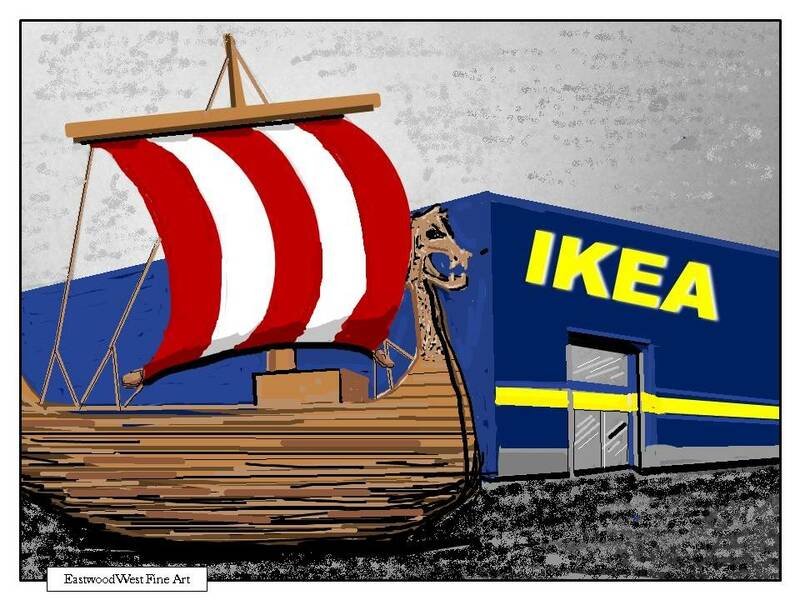 There was no medieval Ikea. The Viking expressed his aesthetics by what he stole. In the ninth century the Norsemen so enjoyed looting England that they decided to seize the entire country. They nearly succeeded, overrunning Northern and Eastern England. But for King Alfred rallying the English in a last-ditch battle (and earning himself “the Great”), today Lundholm might be the capital of Anglemark. The Vikings had been thwarted but they still controlled almost half of England. They could enjoy it and settle down. The Vikings acquired English wives–often over the bodies of English husbands–and began to assimilate. With varying degrees of sincerity, they converted to Christianity. (Odin and Thor had let them down.) This domestication was aided by the similarity between Norse and Old English. For instance, the Angle-Saxon lived in a hus, walked through a dor, over a flor and into a rum. 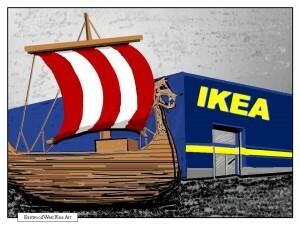 The Viking then stormed that huis, kicked in a dyrr, stomped the florr and into a ruim. Translation was hardly needed. When there were distinct differences in the vocabularies, the Norse sometimes adopted the English word. The Vikings found the English weall easy to breach but irresistible to say. However, the Norse were not so accommodating over what to call the scenic hole in the weall. The Angle-Saxon called it an eyethurl, which means “eye hole.” Perhaps the Norse found it difficult to pronounce or lacking in poetry. They insisted on calling the disputed aperture a windauga, and bullies do have a certain power of persuasion. Eastern England called it that, and western England probably thought it wasn’t worth a fight. On this day in 1894, Captain Alfred Dreyfus was arrested for espionage, accused of giving France’s military secrets to Germany. The charge itself seems incredible. What would the vastly superior German army learn from spying on the French. Souffle recipes? The Germans would have ruined them anyway by adding sausage and potatoes. Dreyfus also happened to be innocent. However, the Army had reached its verdict before the court-martial, and any inconvenient contradictions–such as the evidence–were considered an insult to the image of the army. Dreyfus had to be guilty, and the facts were irrelevant. The Conservatives of the time were indignant that anyone would weight the innocence of one man (and a circumcised bourgeois at that) against the honor of the Army. Michael Medved: The skewed liberal perspective is missing the real story. This situation really is a compliment to the French Army. A Jew can be an officer! I am thrilled to know that. What a tribute to this country! Every Jewish boy in France can grow up to be a Captain Dreyfus! Bill O’Reilly: What is Dreyfus’ problem? If he didn’t want to be a scapegoat, why is he Jewish? It is what these people are good at, that and violins. Talk about an easy job, for doing nothing, he is going to spend a few years at a tropical resort. You and I should be so lucky, but we have to work for a living. Ann Coulter: Of course, Dreyfus is guilty. The army ordered him to be guilty and he refused. That is the definition of treason. Donald Trump: You can see the pattern. Alfred, Alsace, alien, Allemagne, allied to the Ottoman Empire which worships Allah. And what kind of name is Ottoman? Otto is definitely German. So Germany and the Ottoman Empire are actually the same country, and Alfred Dreyfus is really a Moslem.